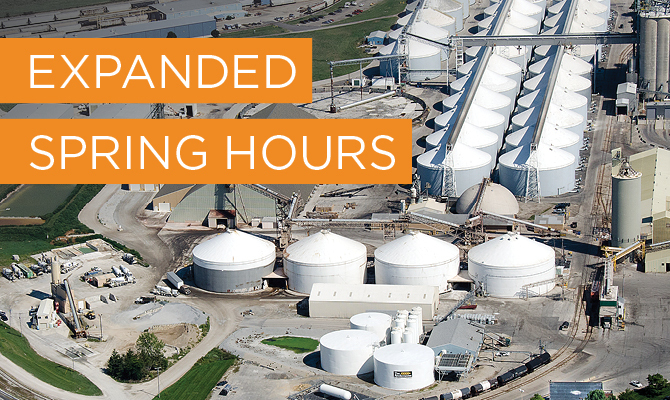 To better accommodate your needs, our fertilizer facilities are providing extended loading hours during the spring season. Below is a list of these hours by facility. Additional pick-up times may be requested outside of these hours. Please call the appropriate facility contact below to determine availability. Once extended hours have started at a location, they will remain in effect, barring weather or other unforeseen circumstances, until the season is deemed over, or until demand has dropped. Check this page regularly for any updates. For additional hours on Monday-Saturday or for Sunday hours, please call ahead. For additional pick-up times, call 419-396-3501. For additional pick-up times, call 855-662-7236.